When it comes to landing pages, we need to create them by making a lot of research and analysis based on the type of audience that we are targeting. It is more important to squeeze the best results from the people visiting the landing pages as an untargeted one will only be a waste of time, energy and resources as well. Do you want to get a tremendous enhancement to your conversion rates and sales? If yes, I would advise you to use a good landing page builder in creating the best landing page that would act as an active converting page of your website. However, you need some proper tools in creating the productive landing pages. To help you in recognizing the right landing page building tools, we are going to compare the two leading landing page providers and see how they fair in a point to point comparison. Before revealing the details of those well-known landing page software, let us tell what landing pages exactly are! If you are using the internet for a long time, then you might already have seen many landing pages constructed by the internet marketers with eye-catching headlines, brief product/service details, testimonials, strong call to action, images and videos for their target audience to increase the sales/conversion. So, the landing page in layman’s term means that the page created to promote/generate leads from potential customers/clients and run a profitable business. But this only works when you create a landing page that has all the necessary elements to squeeze leads out of visitors. This is why it is important to use a good landing page creation tool. Now, let’s compare the two great landing page tools, GetResponse & LeadPages with each other by services they offer so that you would make a decision which one is suitable to be named as the best landing pages generator. GetResponse is mainly as an Autoresponder service that has an additional feature of creating landing pages. You get more than 100 premade templates that are not only responsive but can be edited using the drag and drop builder that GetResponse provides. 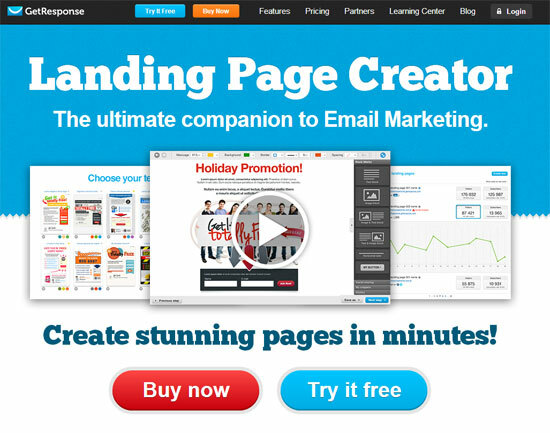 This landing page builder can create the best landing pages with the following features. More than 100 templates: GetResponse provides you more than 100 templates which are not only suitable for different purposes but they are also 100% responsive and hence they are good for visitors coming from mobile devices as well. Web forms integrated: Since it is a feature provided by GetResponse, you can use the web forms to get leads from the visitors efficiently. Free Images: You’ll be getting thousands of high-resolution pictures that are free to use. Drag & Drop Builder: Creating the landing page with GetResponse is very easy with the drag and drop builder you get. You don’t need to have hours of HTML experience to create a simple landing page. Just choose a template, edit it and you are good to go. 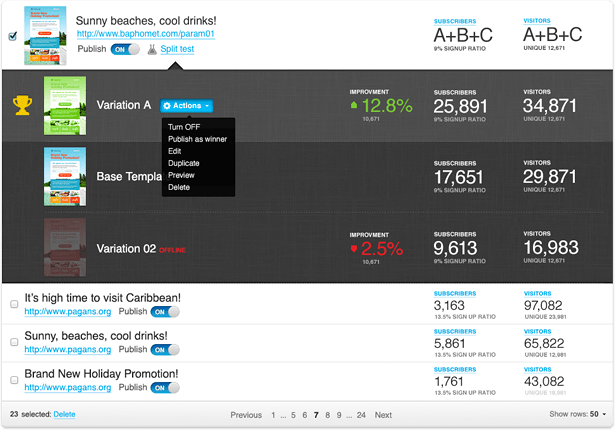 A/B Testing: You can perform different tests on the landing page you create to get the best results out of them. From the analytics report, you can get a better perspective on the customer preference. Google Analytics Integration: You can integrate Google Analytics into the landing pages that you create to keep a tab on conversion rates, unique views, and other valuable insights. Social Media support: To get social traffic, you may share your landing page on Facebook & YouTube. Pricing Plans: Flexible pricing plans starts from $15/month. Like GetResponse, LeadPages boasts attractive features as well. 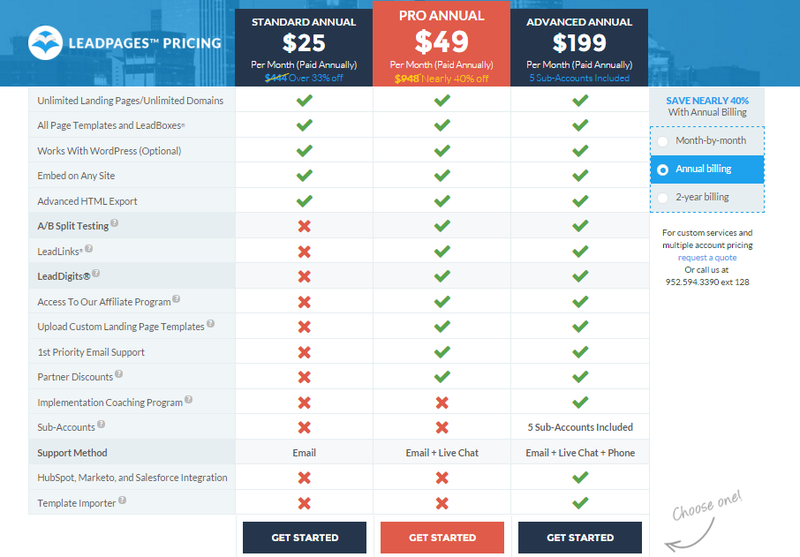 Templates: You get more than 70 templates choices for the landing pages you create. After creation, you can choose to deploy these landing pages on WordPress or your own server using the HTML code you get. You get many free as well as paid templates that are not only responsive, but they can be used in different applications like providing downloads like an ebook, etc. or just for creating email squeeze pages. Host your landing page on LeadPages: LeadPages allows you to host the pages that you create with LeadPages on the hosting provided by LeadPages itself! This is good if you want to eliminate the hosting charges for your campaigns. Ease of publishing: LeadPages offers you easy options for publishing the landing pages that one creates. You can get the code for your landing page and use on a static page, or you can embed the landing page on a WordPress site easily. Analytics: You can easily use an analytics tool such as Google Analytics or Statcounter with LeadPages to analyze the traffic you get. 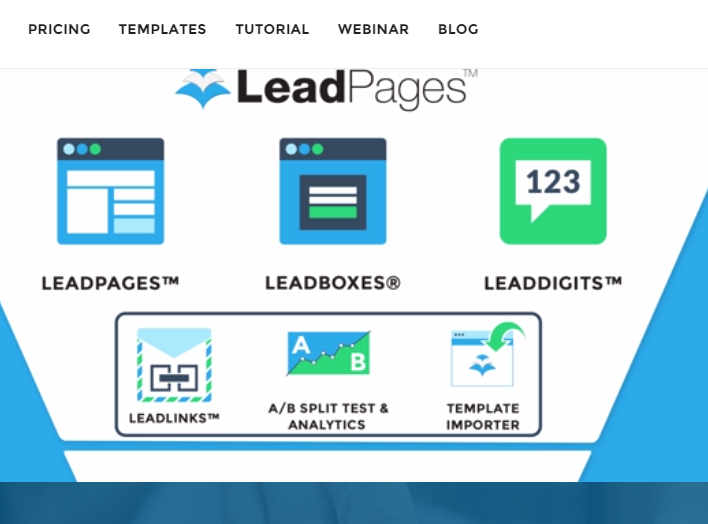 Integration with email marketing platforms: LeadPages has an Autoresponder built in but to get more results out of your landing pages, you can use a third party service like Aweber, Mailchimp, GetResponse, etc. Webinar integration with GoToWebinar: You can also create landing pages for your webinars using your GoToWebinar account. This is good if you want the people who are attending the webinar on your landing page to submit their email there and then itself. You need things like these in a landing page builder which will help you in creating a useful and productive language page. Autoresponder inbuilt: Even though LeadPages is landing page creation software, there is an Autoresponder provided to you that you can use to send your email contacts emails related to their rewards for signing up, etc. Other built-in preferences: Split testing, WordPress integration, and SEO features are inbuilt in LeadPages landing pages. 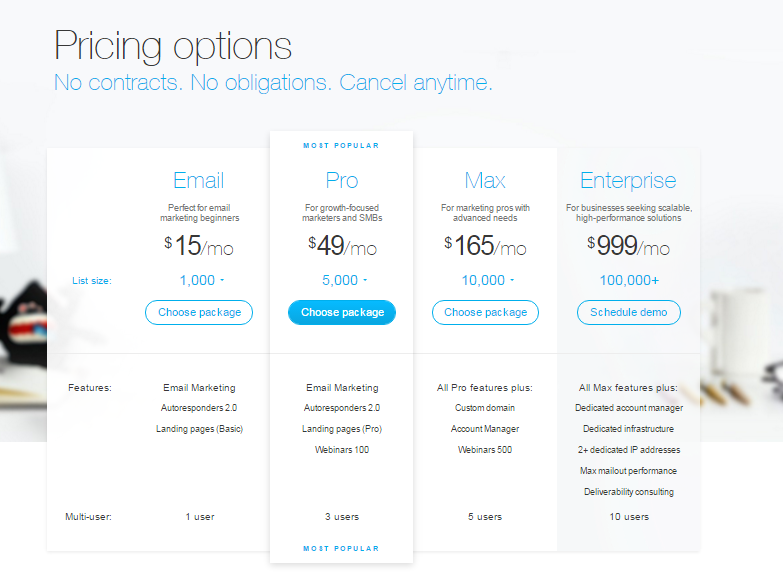 Pricing Plans: Limited number of pricing plans starts from $25 per month. GetResponse is no doubt a great landing page creator if you need to have an excellent Autoresponder that can do a lot of things like automating emails on certain actions like email verification etc. On the other hand, LeadPages is a dynamic tool for creating the landing pages but with a limited Autoresponder feature. If you’re giving preference to split tests and landing page with hosting option, you may choose LeadPages. But, if you would like to select a top landing page builder with optimized themes for best conversions, Autoresponder features, Analytics support, social media compatibility and affordable plans, then you should go for GetResponse to build the best landing pages for your business website. Previous: How To Book A Tatkal Ticket On IRCTC?